Ever since Mario Monti appeared on European stage last year to replace the inconsistent, arrogant and unmanageable Silvio Berlusconi, whose governance was pushing Italy fast to default, many things have changed. Yet with his first 100 days as head of a technocratic government in Rome, he managed to draw the attention of Angela Merkel, the German chancellor, who lived in a difficult but solid tandem with former French President Nicolas Sarkozy, popular with the nickname "Merkozy". Because of Monti's good performance on national stage, a triangle was born, as I described it back then - SarMerMonti (Sarkozy, Merkel, Monti). Mr Sarkozy lost the presidential elections in May to the socialist Francois Hollande who, however, does not manage to produce a working duo with the German Chancellor at a time when this is very much needed. 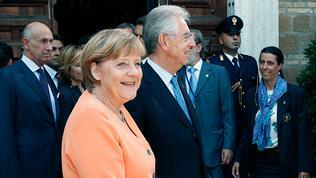 And exactly when many thought that in fact Mario Monti won a battle against Angela Merkel (or more precisely against the hated austerity policy), together with Spanish PM Mariano Rajoy and French President Francois Hollande, happened the summit in Rome on July 4th. 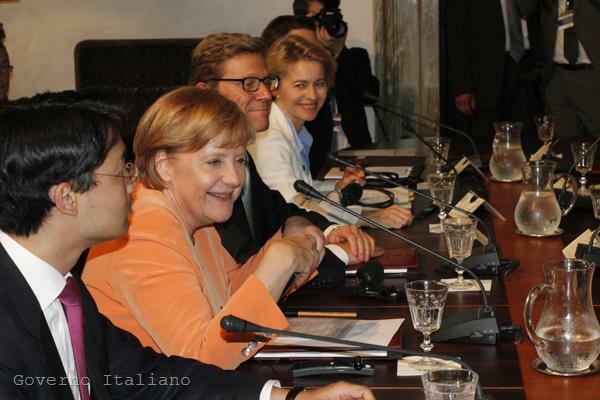 In villa Madama in Rome, there was not just a summit between the leaders of Germany and Italy, but there was an intergovernmental session, which will be followed soon by inter-parliamentary contacts - a clear sign that the new duo that will govern the EU is Italy-Germany, despite the unpleasant result from the semi final at the European football championship, which took place precisely during the EU summit and ironically was led by a French referee. A business- or love-based marriage? If the relationship with Sarkozy was more or less a result of the good diplomatic skills of the former French president and Angela Merkel's need of a strong ally, it is evident that the new alliance "Mermonti" is based on mutual sympathy. This was visible very clearly during the half-hour long news conference, which the two leaders gave in the late afternoon of July 4th after a whole day of talks and work of their governments. A foundation for their feelings is the fact, highlighted by the Italian premier, that the two countries have a lot in common and that is that they have a solid industry sector, which plays an essential role in today's stormy economic times. The small and medium-sized enterprises are important for both countries because they are the backbone of their economies. Besides, Germany is Italy's most important partner, whereas trade between them amounts to 100 billion euros (as much is the assistance Spain expects to receive for its banks). "We in Germany constantly face the task to tackle demographic change, with an entirely different age structure, to be able to write our homework. We have to be competitive on the global market because this is the only way to create jobs". The Italian and German governments will continue their cooperation but more frequently will meet the foreign ministers, the minsters of labour and transport, in order to share experience and find answers to the following questions: "How can we help young people find a job? How can we improve infrastructure? How can we tackle unemployment in general? 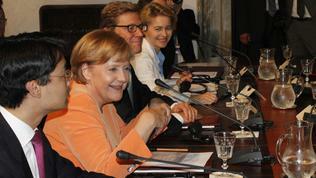 How can we help the small and medium-sized enterprises", were the words of the German chancellor. The Italian prime minister recalled that labour reform had already been passed by Parliament in a moment when youth unemployment was among the highest in Europe - 36%. In full synchronous with him and with a broad smile, visibly content, the German chancellor highlighted the skills of her new partner as a reformist. In order to disperse any doubts in the sustainability of the new relationship, Mario Monti summarised, saying that he shared the German economic view, which he reproduced in Italian-German as Sociale Markt Wirtschaft (social market economy). For him Germany is an example how competitiveness could have positive impact on global markets. 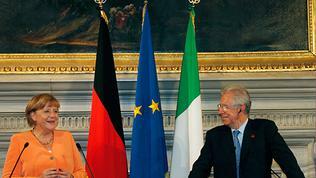 Angela Merkel in her turn stated her full confidence in Monti, saying that she always managed to agree with him when this was necessary, and the Italian PM added that he went well with Merkel in spite the fact that she was German and he an Italian. One of the issues that bothered media and analysts during the Summer European Council in Brussels on June 28-29 was whether the reached agreement, which allows for the permanent rescue fund (ESM) to lend directly to banks and also to be "flexible" towards troubled countries, is not in fact building the foundation for Italy to ask bailout, because, in spite of the successful structural reforms of Monti's government the 10-year yields, considered a benchmark for financial health, maintained too high a price - near to what usually made countries to succumb to market pressure and ask loans - around and over 6%. Mario Monti was the politician who was adamant in insisting the rescue funds to be allowed to directly recapitalise banks, which is essential for Spain as it too has good consolidation policy but its banking system is a victim of the property bubble and exerts high pressure on the country's economic perspectives and on the budget. In the early morning of Friday, June 29, the Italian premier rejected speculations that Italy was preparing to ask for a loan, stating that he invested efforts for the entire eurozone to be rescued as this was in Italy's interest too. 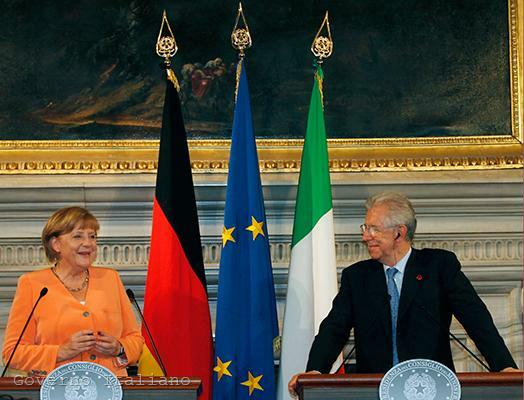 At the meeting with Merkel on July 4th he again recalled that he wanted to help enhance the stabilisation mechanisms of the euro area as this is a way Italy to be stable too. This year Italy's budget deficit will be 2% of GDP, which is half the average in Europe, Monti boasted. Next year the European Commission forecasts a surplus, which is visible for the markets but they assess the euro area as a whole, he added. 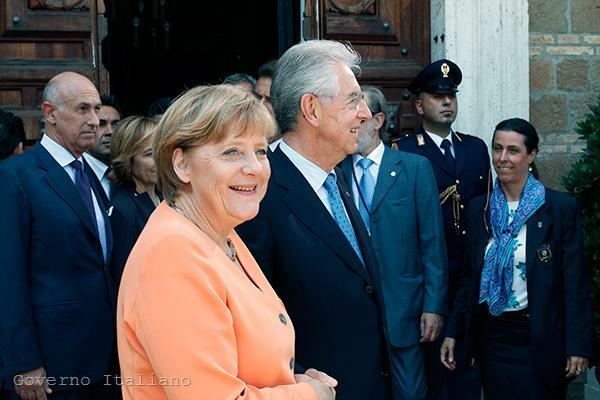 Thus, with smiles and with "Angela" and 'Mario", ended an important summit this week, which has put the beginning of a new tandem - Mermonti. 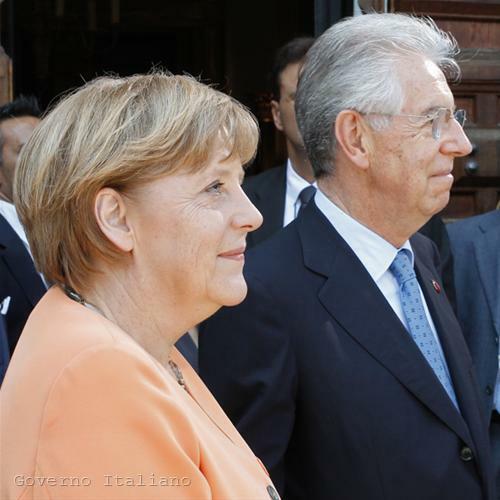 "Our two countries are among the EU members who can contribute at best to delegate sovereignty to the EU, if this means tools for political and economic policy that are more efficient and effective but without preventing all of us from writing our homework", explained the goals of the new duo Mario Monti and thanked the German chancellor, turning to her with "Angela", for returning to Rome. She thanked him back, saying: "This is a beautiful place. I always try to watch the ceiling, just be careful not to ruin it with your pictures. Rome is a beautiful place. Thank you, Mario, for inviting me!" Alas, the couple will not be able to afford a honeymoon because there are thick clouds at the horizon. Both face elections in their countries. Mario Monti is not elected. He is literally appointed to govern Italy for some two years, but it is not excluded this term to be cut, of which speak the growing signals that the big political parties, including Silvio Berlusconi, may withdraw their support for his government unless the economic situation is relieved. 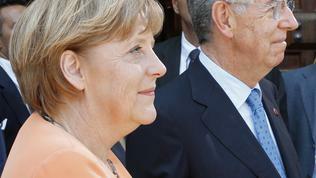 Angela Merkel is also facing serious internal problems and elections next year. At this stage, however, it is necessary that they stick together because at European level too they have troubles. With the ink still wet under the agreement for the euro area from Friday morning, on Monday already the first cracks appeared in the compromise, agreed after all night of negotiations - Finland and the Netherlands announced that they were against the rescue fund to buy bonds of troubled countries at the secondary markets. So, the Mermonti family will have a tough summer, probably without rest, but together instead.